Every year for Christmas my closest friends and family are the (lucky?) recipients of some creations from my kitchen. Everything from cinnamon fig preserves to rosemary garlic butter, I make little jars of love throughout the year, store them away, and then ship them off. Those who live close often get extras as batches are made. My mother and my best friend, however, are a bit more forward with their requests. A jar that once was full with apple butter will be returned empty and cleaned...with the implication that is needs to be refilled. Recently, my bff showed up with a small jar that once held basil pesto made from herbs grown in my own yard. It was pristine and had a small note attached that read, "for pesto." This wasn't a reminder of what I had put in there in the past, so much as an order for what needed to go back in. As it would have it I just made a batch of spicy collard green pesto with some goodies from my CSA. So I reached into my fridge and simply exchanged jars. Chop greens coarsely. Blanch them in boiling water for 3-4 minutes. Remove to colander and rinse with cold water to stop cooking. 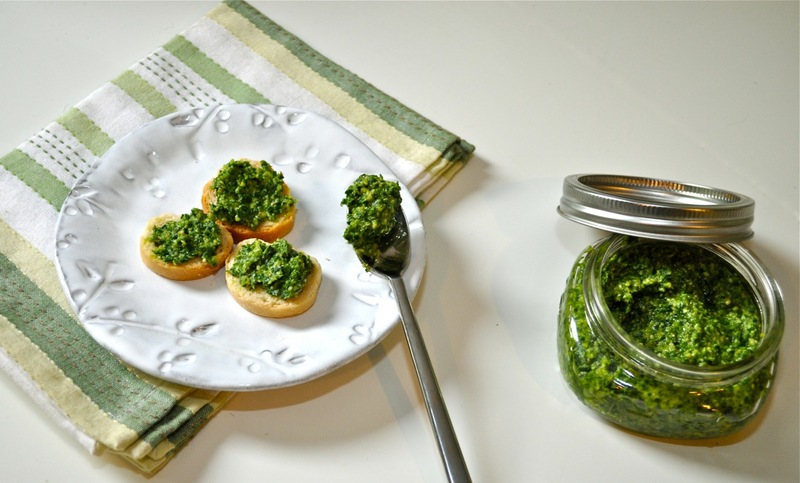 Place greens in food processor with remaining ingredients. Blend thoroughly. I ate my portion of the batch on small toast bites, almost like a dip. But this spicy and strong spread would be great on a pizza too. 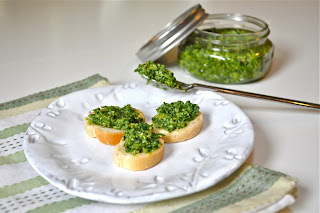 I'm sure my best friend will find her own way to use up this twist on pesto...and then I will get another empty jar. Thanks for the refill! It was delish on some grilled shrimp last night!